Morpho has an executive mandate to classify all information, whether it be physical or electronic. This is in order to meet requirements to protect intellectual property, as well as to comply with the Export Administration Regulations, which regulate the export of commercial items that are dual-use within the military. 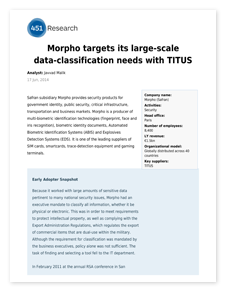 Read the user deployment report from 451 Research to learn how Morpho meets its data-classification needs with TITUS.